Sustainably protecting a rich and exquisite heritage. Today, precious hardwoods are too often being thoughtlessly wasted in Vietnam for the impersonal mass production of low-grade products. The time has long been due to end the exploitation of the forests. Just as traditional fishermen are humanity’s truest custodians of the sea, genuine traditional wood workers are most interested in the maintaining and preservation of the woodlands. We believe that by contributing to the forests’ livelihood while using the resources with utmost care and craftsmanship, they can be harvested in a sustainable and beautiful way. In our workshops we treat these precious hardwoods with great mindfulness and appreciation. 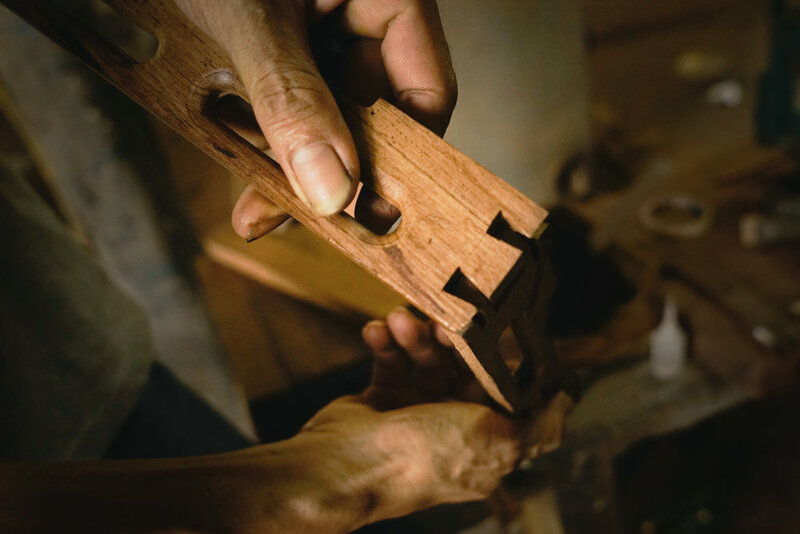 Through the work of our humble craftsmen, we are helping to keep one of the country’s most precious crafts and its true values from dying out. We are committed to our tradition that has lived through a great ancestry defined by diligent and devoted workmanship. Our craftsmen proudly identify themselves in their work. They understand best that the dignified home is brought together by the grace of its furniture, allowing for its owner’s aesthetics and values to be elegantly and effortlessly expressed. All our pieces have been carefully crafted from the finest traditional and contemporary designs, handcrafted with the greatest appreciation for the precious material. Our woods are carefully selected, seasoned and dried. No chemicals or stains are used in the wood treatment; we only allow lime, natural shellac, and wax. All parts are jointed together by the most sophisticated wood joinery works; no screws or nails are ever used. For this reason, we take pride in our collections that are truly precious and timeless. Classical carpentry does not allow the use of screws, nails or any metal part inside the wood. According to Feng Shui, metal hidden inside wood would debilitate the wood's intrinsic strength and influence its aura in a negative way. Independently from that, any master carpenter knows that a nail or screw would wound the living wood; over time it will be torn from the inside. The years are counted for the furniture piece with foreign elements. All wood parts of our furniture are coupled together by wood joints. There are over 500 different joint designs, many of them highly complicated. Only the well-seasoned carpenter masters the large part of those. A good piece of furniture does not look like it is made of parts. It feels and wants to be treated as if sculptured from one single block of wood.